Now for my way overdue and final dental sequel. 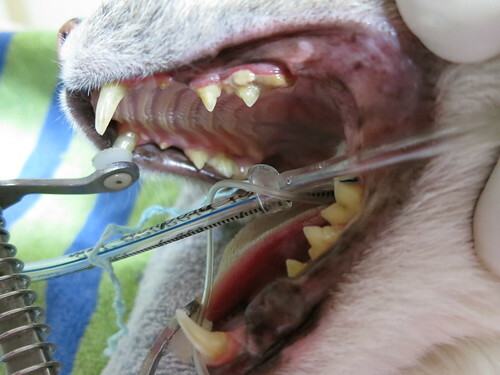 The main topic is feline dentistry and there will also be a brief discussion about dental problems in other pets. 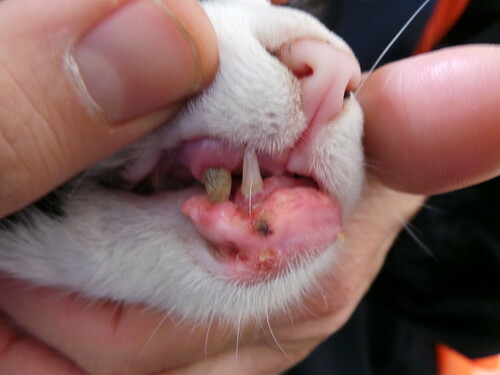 There will be some overlap with canine dentistry but the focus will be on the unique oral inflammatory diseases that affect cats! 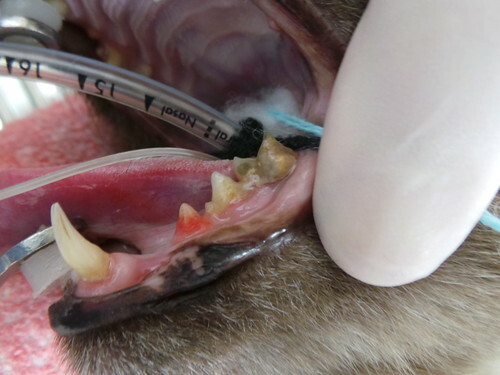 We previously discussed how dogs are good at hiding their dental disease. Guess what, cats are even stealthier than dogs at doing that! 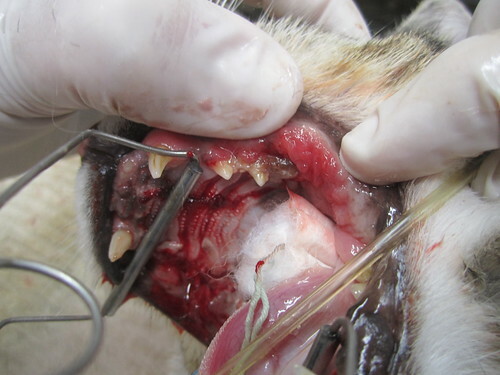 I often hear owners exclaim in utter surprise when I inform them that their cat has an infected or broken tooth. They are shocked because their cat did not display any signs of discomfort and was eating quite well and was only brought in for a routine health check. George is one case that clearly shows how discreet he was about his dental ailment. He came in for his annual health check and vaccination booster and his owner thought he was in prime health. 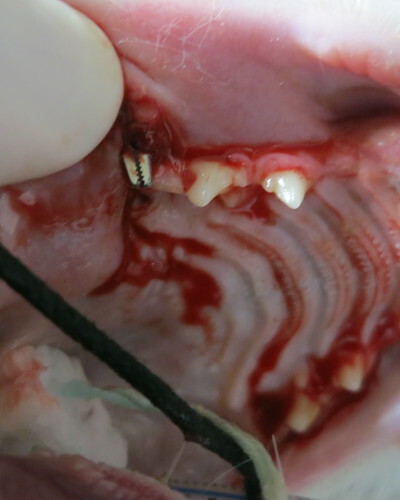 We discovered he had a fractured upper canine with a discharging sinus. He was immediately booked in for a general anesthetic and tooth extraction. 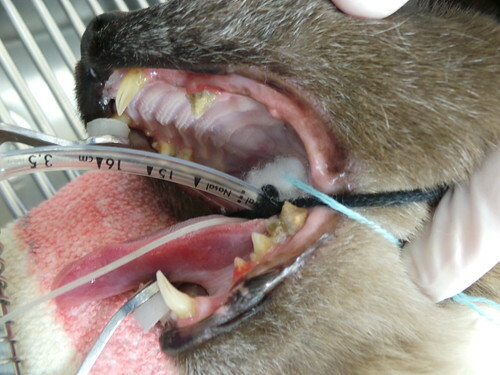 This emphasizes the importance of getting your cat used to poking around in its mouth. Ideally, you want to gently teach your cat that lifting his/her lips is by no means invasive from a very young age. Some cats will be quite non-compliant while most will be very tolerant. Generally, the trick is not to forcefully pry their mouth open. You simply need to lift their upper lip. My feline patients always allow me to have a quick and swift look. They only react if they are being overly restrained or if they have a very sore mouth. dribbling, chewing like they have a bad taste in their mouth or even completely going off their food and losing weight. Retained deciduous teeth. 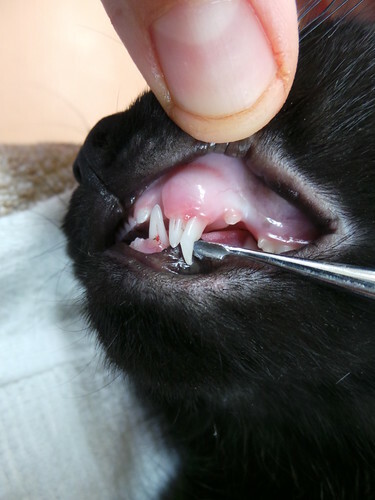 Best to remind your veterinarian to check your kitten’s mouth when he/she is being de-sexed (spayed, speyed, neutered, castrated) and to remove any retained teeth. Tooth root abscess. It is important to note that they can easily be confused with a cat fight abscess. 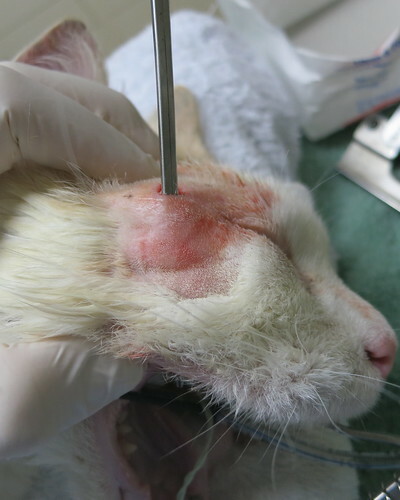 Basically if you drain them and they aren’t resolving, then it is clear that the abscess has formed secondary to an infected tooth rather than an altercation with another cat. Treatment revolves around removing the culprit tooth. 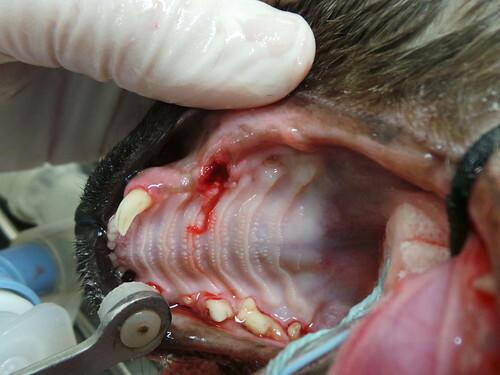 A veterinarian must always confirm that there is a communication between the drainage point of the abscess and the tooth extracted. N.B. ‘Jester’ in fact was suffering from a battle wound with another cat and not a tooth root abscess. Apache getting his tooth root abscess probed and confirmed. 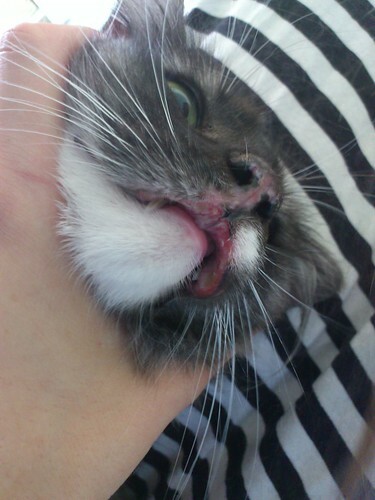 Here’s Puss puss and we initially thought she only had a cat fight abscess but the swelling didn’t resolve. 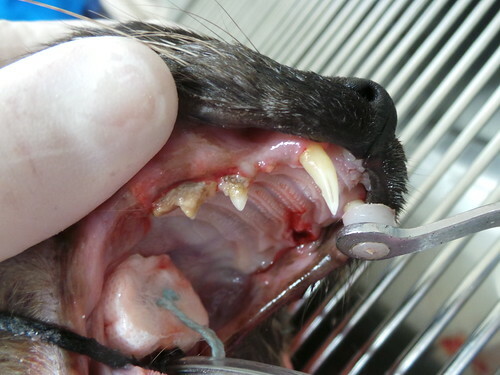 That is when we proceeded with a general anesthetic and extraction of the affected tooth. 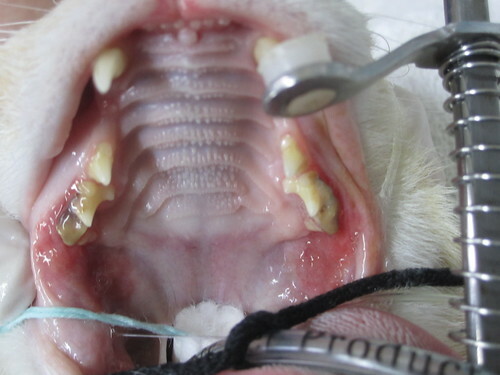 A sudden development of a really bad breathe (referred to as ‘halitosis’) in your cat definitely warrants a general anesthetic and thorough oral examination. 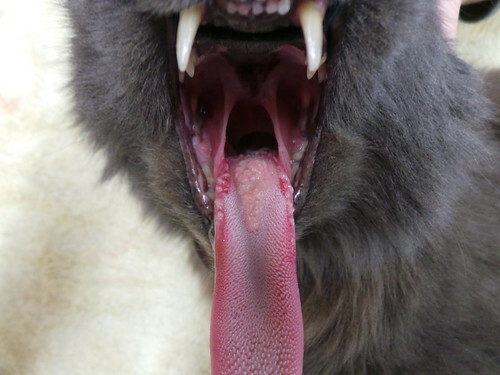 I recently had one of my feline patient completely battle against a thorough oral examination. From the brief examination, I had spotted he had a few infected lower premolars. We proceeded with a full general anesthetic and dental. Unfortunately, I discovered his rotten teeth were not the main source for the bad breath. 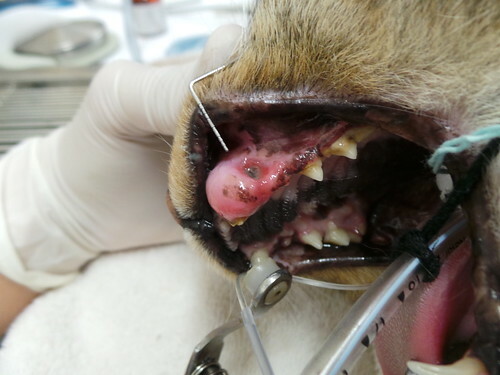 Sadly, he had a very aggressive and invasive oral tumor. 1. 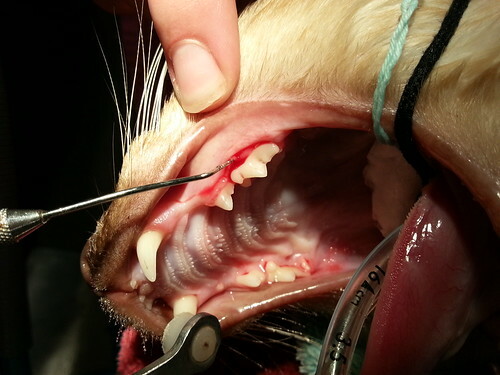 Periodontal Disease (PD): This is by far one of the most common chronic diseases affecting cats these days. In my routine feline consultations, I rarely come across a young cat that is free of this disease which is bacterial in origin. Typically, you notice inflamed and reddened gums. 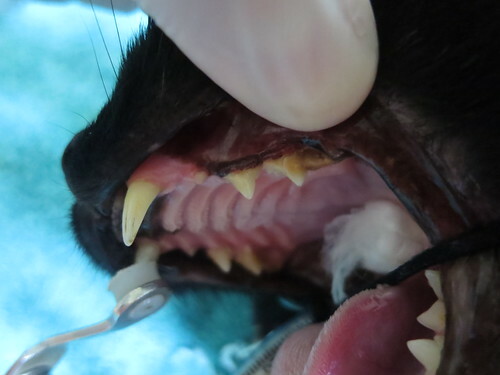 Cats with compromised immune systems such as those that are FIV (feline immunodeficiency virus) positive are prone to developing a severe form of periodontal disease. Hence, it is important to get your cat tested for FIV especially if it is showing periodontal disease and was adopted from a shelter. I am always making sure my clients are immediately involved in slowing down the progression of their young cat’s periodontal disease. In the acute phase, they may require antibiotics to reduce the bacterial load and prevent exacerbation of the periodontal disease. 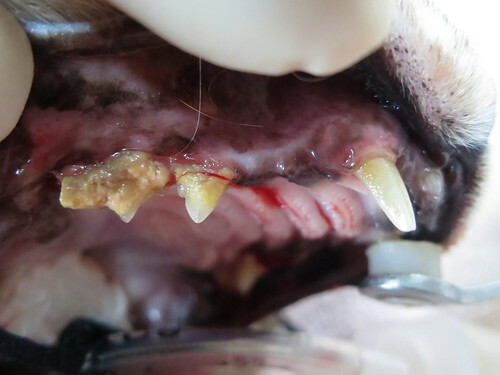 If there is a severe tartar or plaque buildup, then a quick general anesthetic and dental scale must be recommended as a first line of treatment. However, home-care is by far the most crucial step in the continued successful management of this dental disease. Avoiding soft tinned food that promotes tartar and plaque build-up. I commonly refer to this as JUNK FOOD. Don’t encourage your cats to binge on poor quality diets. I am all for encouraging your cats to have a higher water intake. Instead of spending your money on tinned food and ruining your cat’s teeth, invest in a cat fountain and this will often encourage your cat to drink more. Discussing the raw meat diet: fresh meat +/- raw bones. Remember cats can devour an entire rabbit/mouse so don’t be fooled into thinking they can’t eat raw bones! Consider the prescription diets like hill’s feline t/d especially formulated to help reduce tartar/plaque build-up. 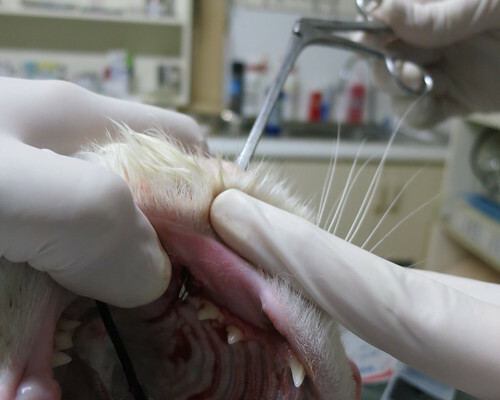 Owners must get involved in brushing their cat’s teeth: This will definitely pose as a challenge for those middle aged to geriatric cats that have never been exposed to such meticulous probing! Generally, however, young cats are diagnosed with this condition and so you should be able to get them used to getting their teeth cleaned. Hexarinse is a mouth rinse that veterinary dentists now recommended. The trick is to apply it to a gauze swab and gently rub each individual tooth once every two days. 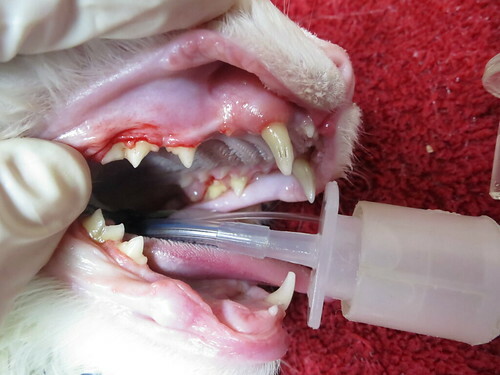 You don’t have to brush all your cat’s teeth in one session, pace yourself. 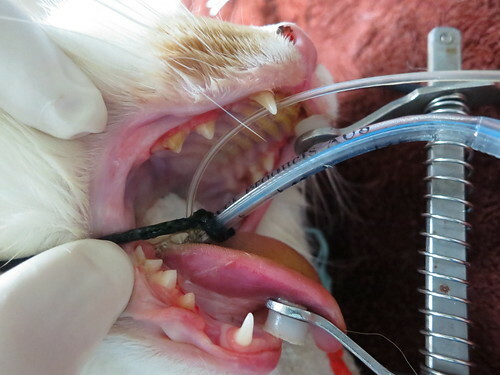 This should reduce the bacterial load and prevent exacerbation of your cat’s periodontal disease. If your cats is non-compliant, then book him/her in for regular dental scales, say every 6 months. This may sound like an expensive option but is in fact cheaper in the long run. 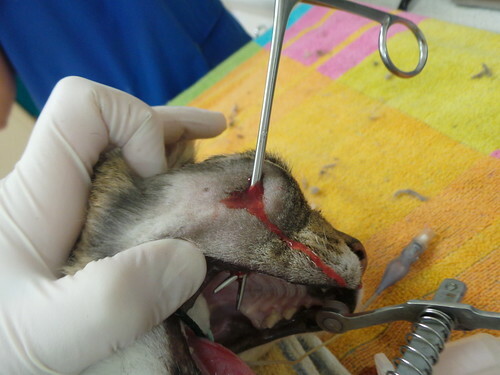 Your cat will only be exposed to a short general anesthetic and 10-15 minute dental scale. 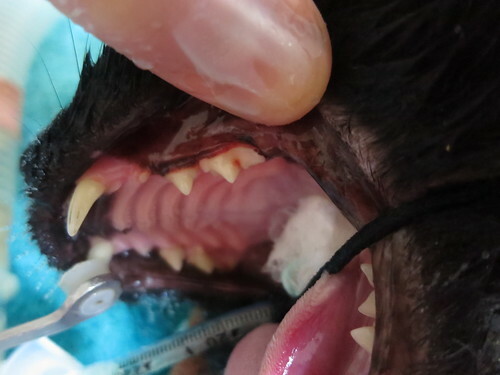 This is in contrast to your cat requiring a massive and very expensive dental procedure including tooth extractions/dental x-rays to rule out any retained roots if his/her teeth were poorly managed. 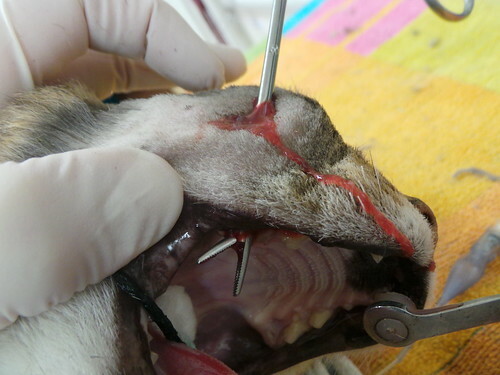 You can only probe a cat’s teeth under full general anesthetic. 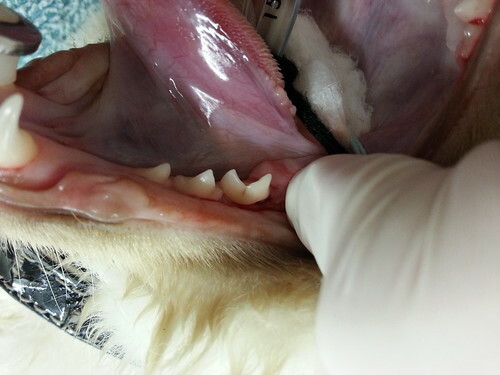 In this case, Buster, a 2 years old Siamese suffering from periodontal disease was having his teeth scaled and his gums probed. 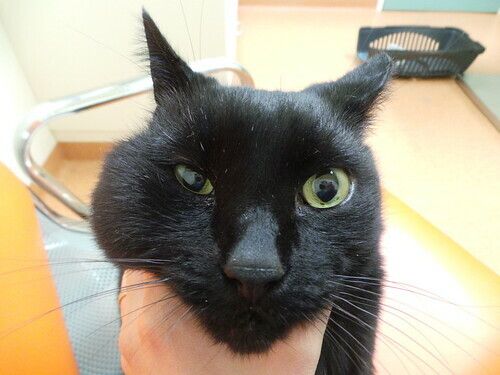 Zorro is a 2 year old Burmese cat with moderate periodontal disease. He is already on hill’s feline t/d but will require regular general anesthetic and dental to prevent further progression of his periodontal disease. 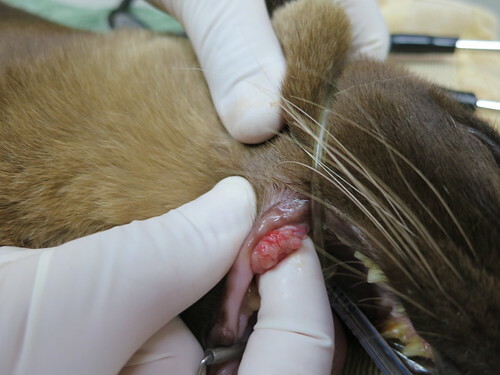 ‘Wei‘ came in for a general health check and we discovered she had a very loose upper canine. She required surgery and extraction of the affected tooth. 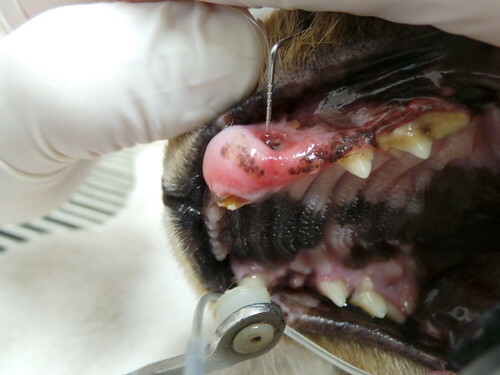 This case further illustrates how advanced periodontal disease can go un-noticed. Collymorn suffering from moderate to severe periodonatal disease secondary to plaque overload on the teeth. 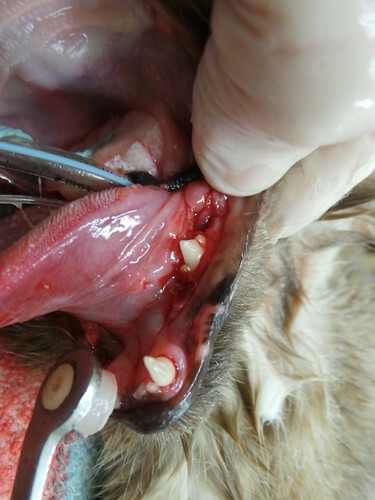 Don’t wait until your cat reaches this stage as often this would mean extraction of multiple teeth that could have been saved! 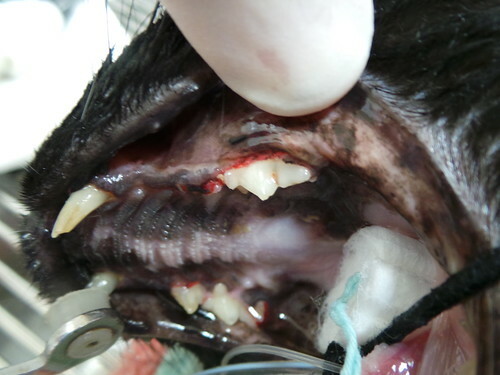 Can you appreciate the severe gingival recession around all the canines? 2. 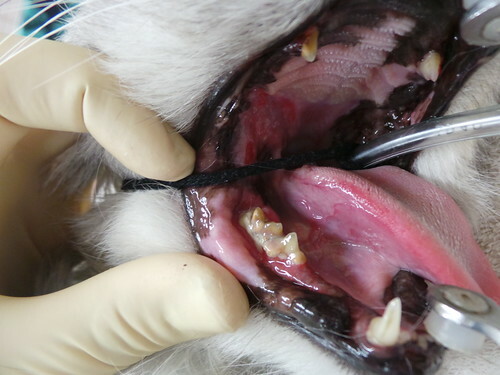 Chronic gingivitis stomatitis: This condition is by far one of the most frustrating feline dental ailments that both clients and veterinarians are faced with. Pure bred cats are highly over-represented (e.g. : Siamese, Persians, Abyssinians). Viral infections: calici virus, herpes virus, corona virus. 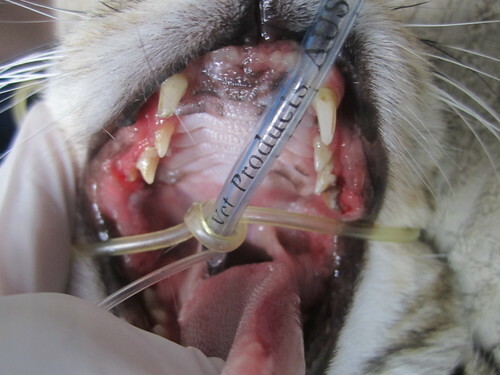 Feline patients diagnosed with this condition are very painful and often don’t allow us to perform oral examinations on them while they are conscious. I have had cats yowl in agony as soon as I even attempt to touch their mouth. It is absolutely heart breaking to be faced with a patient suffering from this disease. 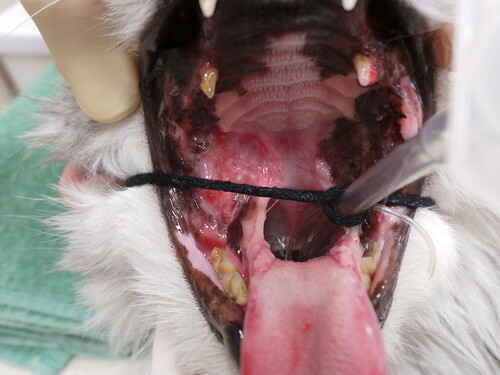 Cats with this condition have severely and widespread inflammation of the oral tissue including the pharyngeal area and even mucosa of the hard palate. Personally, I feel that these cats should be loaded with lots of pain relief and their owners must be fully made aware about the severity of this condition. It is crucial to be clear that this condition has no cure and the best outcome is to manage the condition long term. Professional scaling/cleaning including extractions of any teeth with poor prognosis. Root fragments must be removed. Pulse antibiotic therapy: once every 4-6 weeks or as needed. Anti-inflammatories namely cortisone. You start on a high dose and then try to wean them off and maintain them on the lowest effective palliative dose. The newest recommendation is the use of immunomodulators that are either injected directly into the lesions or given orally. Unfortunately, this options is ridiculously expensive and most owners forgo this option as a result of the cost. 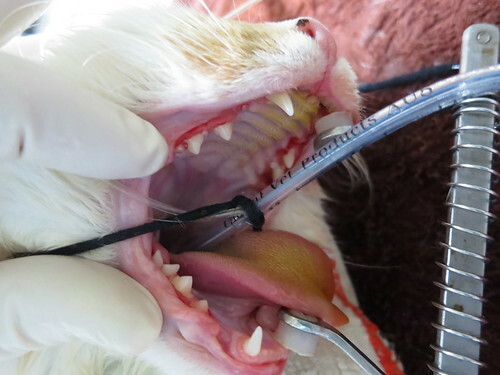 For those cases that can’t be manage by one or a combination of the above options, the best recommendation is REMOVING ALL THE CAT’S REMAINING TEETH. 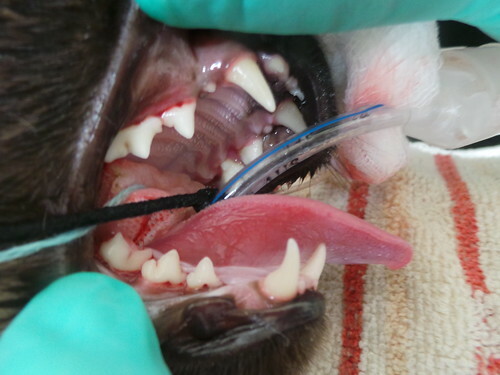 Veterinary dentists also recommend the removal of the periodontal ligament lining the alveolus as well. This option may sound quite extreme to clients. However, this has been currently found to be the option with the highest success rate in managing this condition. 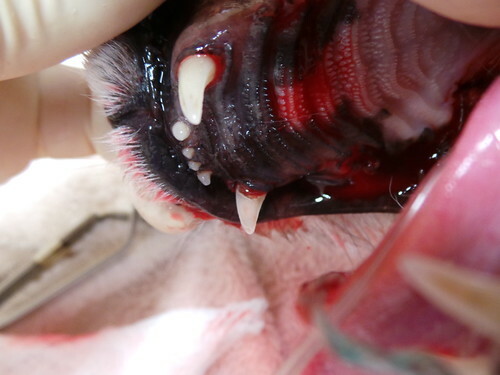 Stomatitis in a cat’s mouth. Can you appreciate the severely inflamed gums distal to the molar teeth? 3. 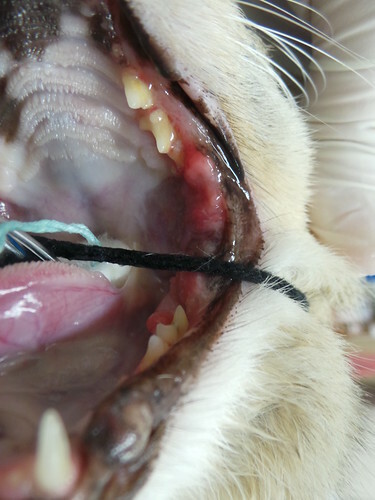 Inflammatory tooth resorptions: This is yet another common feline dental problem. Again the cause of this disease is poorly understood. 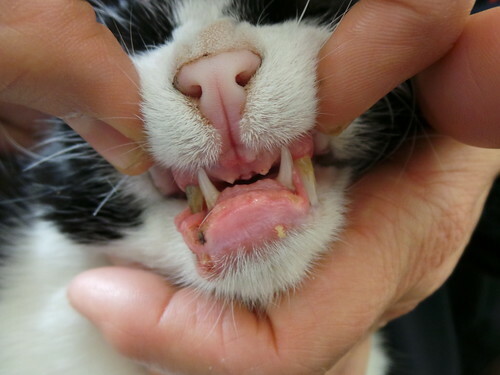 Like periodontal disease, this ailment may go un-noticed or your cat may show obvious tooth ache symptoms. These symptoms include: inappetance, drooling, face rubbing, jaw chattering and weight loss. This disease often goes hand in hand with periodontal disease. It is often diagnosed under general anesthetic when the tartar and plaque has been removed from the surface of the tooth. Early lesions of this condition should be closely monitored. As for the more advanced stages of tooth resorption, it is best to extract the affected teeth. 4. Eosinophlic granuloma complex: This is often due to an underlying allergy. It can be very challenging trying to determine the exact cause without multiple and tedious elimination trials. It has been shown to be associated with insect bites (fleas and mosquitoes), food allergy, atopy, genetic predisposition and even possible chronic calicivirus infection. This Burmese geriatric cat developed a granulomatous lesion in her commisure. It required surgical removal. Well I don’t know about you but I think I’ve covered the topic of feline dentals quite extensively and so it’s time to move on to another species. 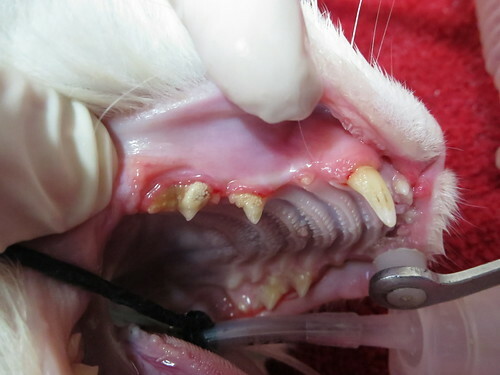 Just promise me this, the next time your veterinarian recommends a dental for your very young cat, please don’t assume he/she is doing that just to milk you out of money. Pay attention and ask relevant questions. 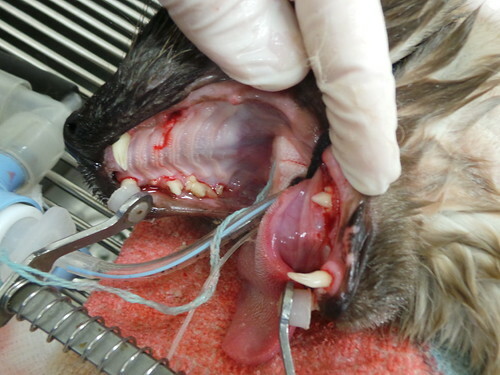 If your veterinarian only recommends a dental without giving you any home-care tips, then you have every right to probe him/her and ask for more information. In most recent times, pocket pets (rabbits, guinea pigs, ferrets, mice etc) have become very popular pets. They too may suffer from serious dental disease and often the first signs include weight loss and this can progress to drooling, facial swelling, lethargy, lack of grooming and even sometimes diarrhea. You should always keep track of your rabbit’s or guinea pig’s weight so that you can quickly pick up on any weight loss and address the possible underlying dental disease immediately. Inappropriate diet can contribute to your pocket pet’s dental disease. However, there are some genetic predispositions to dental problems and certain breeds are highly represented. Please make sure to attend to your pocket pet’s dental problems quickly. 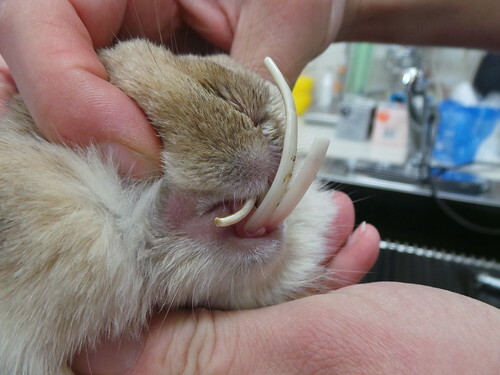 Your bunny will be suffering from serious malnutrition if it has a set of teeth like the two cases below. 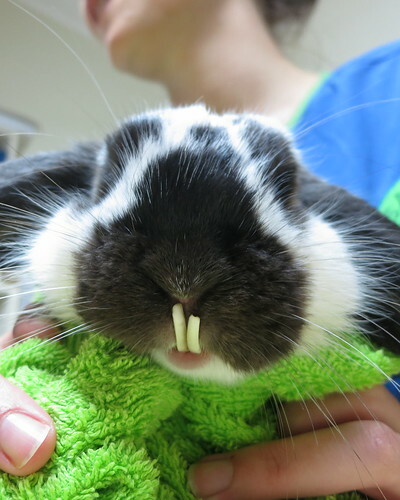 Mr. Snuggles below is a much loved rabbit in good condition that requires regular tooth trims. The next step is to surgically remove his abnormal incisors. Here’s a photograph of Alice, a gorgeous 28 year old Welsh pony, which suddenly started losing weight in the past month. Her blood results were unremarkable. 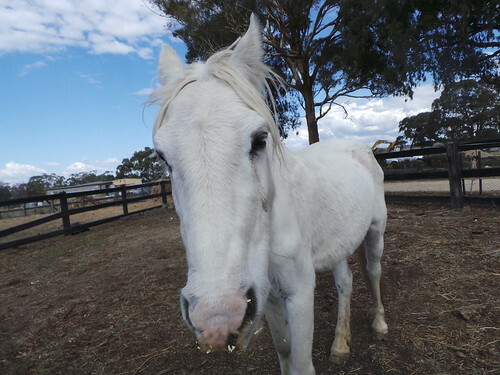 Her owners will be organizing an equine dentist to attend to her very soon. 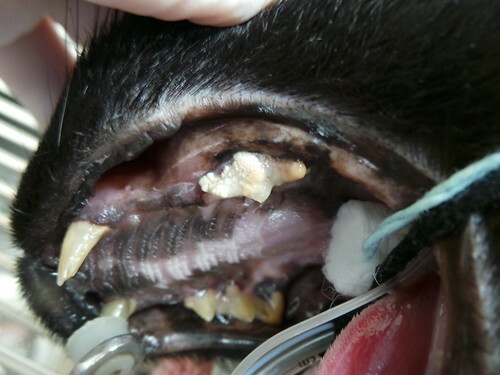 I did my best to cover all aspects of dental disease that may affect your pets but I’m sure I could have done more. So please don’t hesitate to ask me any questions you may still have about this very important topic. ← Do Cats Really Have Nine Lives? 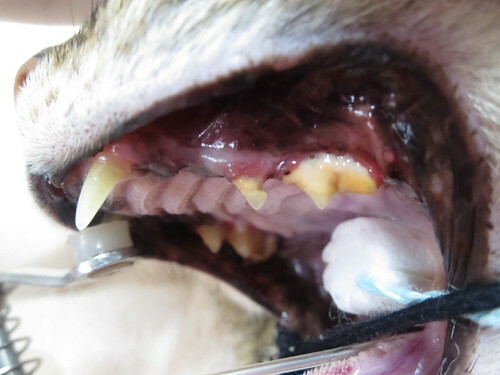 It’s really sad to see how these animals must be suffering with dental disease. 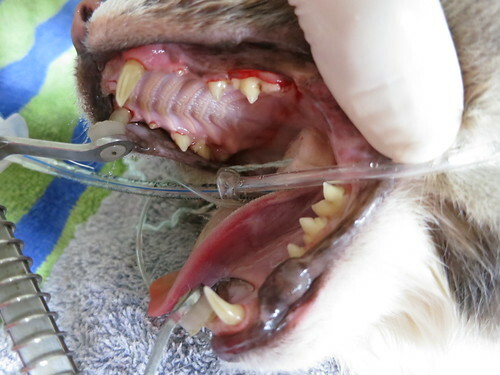 When I read your articles, I’m encouraged not to give up on brushing my dog’s teeth. I started when she was young and it was a good thing. Now when I hold up the toothbrush she runs to her mat to have her teeth brushed. I wish I had done this with all my pets in the past. Thanks for your articles, Rayya, and for bringing this to pet owners’ attention. 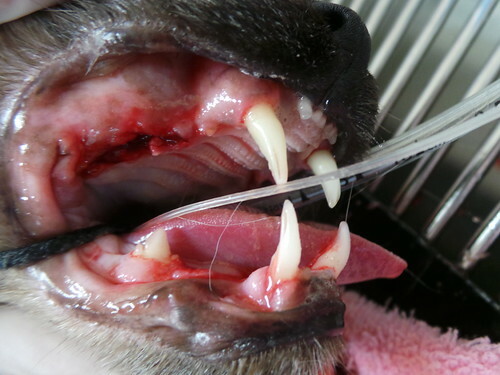 Please definitely keep up the brilliant the great effort with brushing your dog’s teeth. Maybe you can share some tips on how you do it :-). You are more welcome and I appreciate your wonderful comment. Wow. 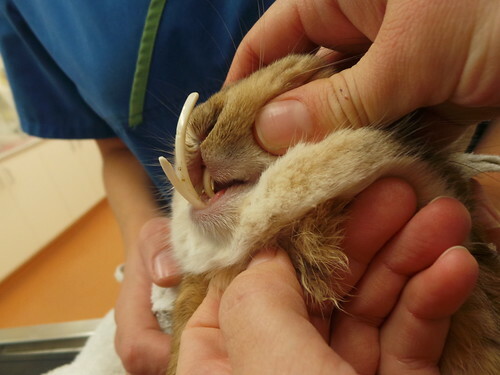 I’m sorry to see the rabbits’ teeth get so overgrown before they were brought in! 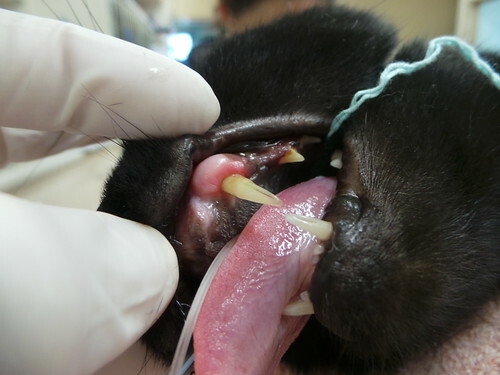 A tumor on a cat’s tongue is easy to miss, but those incisors! 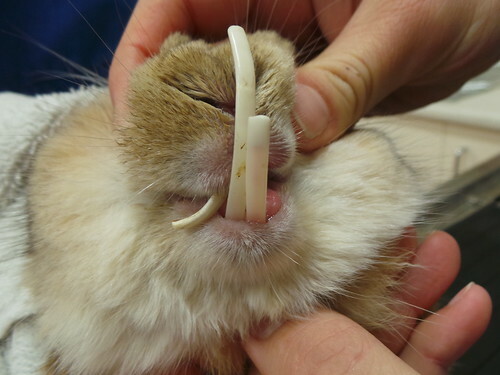 The owners bring that rabbit in regularly to get his teeth trimmed. There is no debate that they were too long and should be trimmed more regularly. 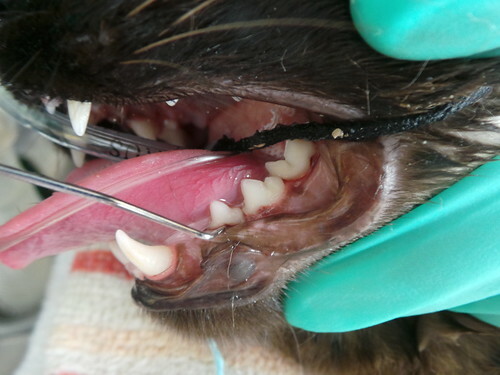 Have you noticed more dental problems with purebred cats than strays that have been adopted? Was thinking perhaps feral cats with problems don’t survive to reproduce, but then again they start reproducing at such a young age that maybe there’s no difference between them and purebreds. Hey Alli. That is a very good point. 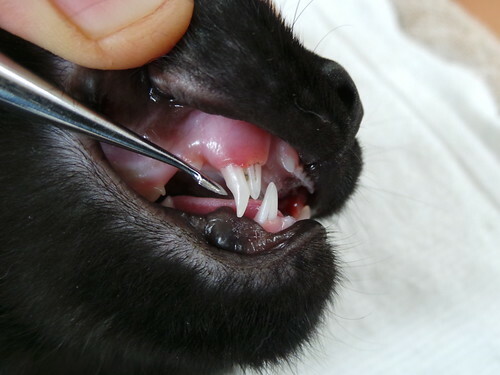 Generally speaking, purebred cats have a much higher incidence of dental disease. 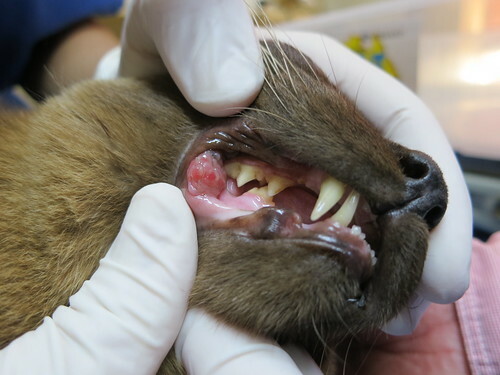 However, feral or stray cats have underlying diseases like feline immunodeficiency disease or feline leukaemia virus or calicivirus or herpes and this has been shown to have some links to dental issues. OMG, OMG — those poor, poor animals . . . . I am glad you’re there to patch them up, but what a pity things came to that. Thank you for the vivid lesson. I was so upset to see the poor kitty with the instrument through his face! 😥 I hope they don’t do that to my baby when they extract his teeth. Once again thank you very much RAYYA . So many health issues related to teeth even in humans especially heart disease. Bev thanks for the awesome feedback. I really appreciate it. Outstanding post!!! Animals need their teeth taken care just like us humans I got to ride my horse and donkey 🙂 GOD is amazing. Bet you enjoyed the ride. I love the high quality pictures. You can really see why its important to clean your pets teeth. Hi Dr Rayya, just wanna say good job on your blog! Australia needs more quality vet bloggers like you to help educate the public about good pet care. Nic , thanks so much for your support. Look forward to checking out your blog. Hi doctor Rayya, we found you from Fozziemummy (Bev Green). Pawesome bloggy you have! Wooooowoooooo! 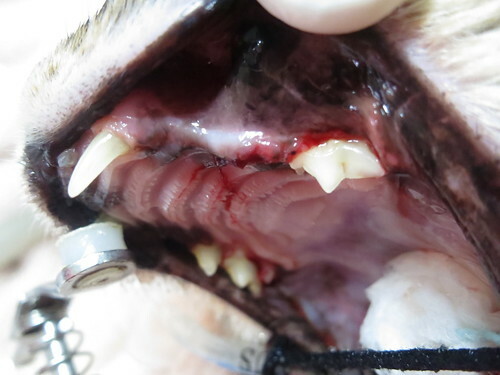 Im wondering how I can help a feral cat who’s teeth I can see are horribly covered with tarter? Actually I just noticed the the junk caked on his teeth this morning. I have been feeding this cat for 12+ years. I cannot get too close or her freaks out. Over the years I have managed to trap him twice ( the first time he had an eye removed, was neutered, tested, vaccinated, De-wormed and treated for fleas) . The second time I trapped him was when we moved to another neighborhood. WE HAVE TWO FERAL CATS (SIBLINGS, WE THINK) THAT FOR 12 YEARS HAVE BEEN FED AND SHELTERED ON THE BACK PORCH OF A NEIGHBOUR, WHOM I’LL CALL MRS. BIGHEART. THE FEMALE, HOPPY, HAS ONLY 3 FEET – FOUR LEGS BUT ONLY THREE FEET. THE MALE, PRIDE, IS SOMEWHAT LARGER AND HAS SAME MARKINGS AS THE FEMALE. HE ALWAYS ACTED AS HER PROTECTOR.BUT NOW IS OLD AND CAN’T FIGHT THE OTHER CATS. THEY BOTH SHOW FOR TWICE DAILY FEEDINGS AT THE BACK PORCH. WHEN HOPPY GAVE BIRTH TO A KITTEN ABOUT 9 YEARS AGO, THE NEIGHBOUR MANAGED TO TRAP IT AND TAME IT AND FIND IT A GOOD HOME. IN DUE COURSE, SHE ALSO TRAPPED HOPPY AND HAD HER SPAYED. WHILE HOPPY WAS INDOORS RECOVERING FROM HER SURGERY, PRIDE HUNG AROUND THE DOOR 24 HOURS PER DAY. EVENTUALLY THE NEIGHBOUR LEFT THE CAGE DOOR OPEN AND HOPPY TOOK THE PATH OF FREEDOM, REJOINING PRIDE OUTSIDE. HOPPY STICKS PRETTY CLOSE TO THE NEIGHBOUR’S PORCH, BUT PRIDE WANDERS AROUND WITHIN THE NEIGHBOURHOOD. EACH FALL, HOPPY AND PRICDE TAKE UP RESIDENCE IN THE CAT SHELTER WHICH MR. BIGHEART, THE NEIGHBOUR’S HUSBAND, MADE FROM 2- INCH STYROFOAM, COMPLETE WITH SHINGLED ROOF, AND EQUIPPED WITH A LOW-WATTAGE HEATING PAD. DURING THE COLD MONTHS, HOPPY AND PRIDE SNUGGLE UP IN THERE AND SEEM QUITE CONTENT. SOMETIMES THEY HANG OUT UNDER THE UPTURNED GARDEN FURNITURE WHICH IS COVERED WITH A SECURED TARP. DURING THE WINTER THE BIGHEARTS SHOVEL A PATH THROUGH THE SNOW TO FACILITATE THEI-R MOVEMENT TO AND FRO. THE NEXT-DOOR NEIGHBOUR CLEARS A FOOT WIDE PATH THROUGH THE THE SNOW FROM THE HIS DRIVEWAY TO THE FENCE, UNDER WHICH HOPPY AND PRIDE SLITHER INTO AND OUT OF THE YARD OF THEIR PROVIDER. THEY SEEM TO HAVE FAVOURITE HAUNTS AROUND THE NEIGHBOURHOOD, ONE BEING THE BACK PORCH OF A HOUSE ON THE STREET BEHIND, WHERE THEY ARE SOMETIMES TREATED TO A PLATE OF LEFTOVERS. ON THAT SAME PROPERTY, THERE IS A GARDEM SHED, UNDER WHICH THEY RETIRE ON HOT DAYS IN THE SUMMER. IN ALL THIESE YEARS, NEITHER HOPPY NOR PRIDE HAS BECOME TAME ENOUGH TO LET ANYONE PAT THEM. MRS. BIGHEART SAID SHE ONCE TOUCHED HOPPY ON THE HEAD BETWEEN THE EARS. AND SO, HOPPY AND PRIDE CONTINUE TO DWELL IN OUR NEIGHBOURHOOD, ON THEIR OWN TERMS; WE FEED, THEY EAT, AND WE DON’T TOUCH. .